Every so often, a group of my Open University colleagues gathers to discuss a book that one of us regards as important or interesting. 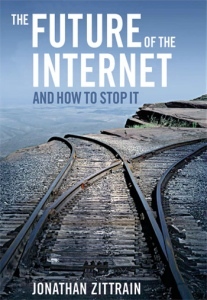 Last week it was my turn to talk about Jonathan Zittrain’s The Future of the Internet — and how to stop it. The mp3 of the talk is here. The sound quality is variable, I’m afraid, and I only had one microphone, so it’s not Radio 4 quality. It runs for about an hour and includes a delicious excerpt from James Boyle’s recent RSA lecture. If you’re listening to it, you might find the slide below helpful. Alternatively, you might find it a cure for insomnia. And if you’re podcast-averse, Doug Clow did an excellent live blog of the talk, for which many thanks to him. This entry was posted in Media ecology, Mobile phones, Technology by jjn1. Bookmark the permalink.